For TV on your PC, the Pinnacle PCTV line has been updated to now support HDTV. Yes, you can watch over-the-air HDTV on your computer with the new Pinnacle PCTV HD Pro Stick. This is not a PCI board or a big external device, it's just a small stick (around 1 1/4 x 2 3/4 inches), with a USB connector at one end and a TV antenna input (F-connector) at the other. There's also an A/V adaptor cable with inputs for composite video (RCA), S-Video, and stereo audio (3.5mm headphone plug). The product includes all the other parts you might need, with a telescopic antenna to set up near a window, and a USB extender cable to reach from your computer. The PCTV HD Pro Stick uses the Pinnacle MediaCenter software to set up the available analog and digital channels, connect to the included remote control, and then watch and record TV and listen to Internet radio. And it includes Pinnacle Studio QuickStart to edit your captured video and recordings. Pinnacle has refocused as a consumer brand after Avid acquired Pinnacle in early 2005 and then integrated Pinnacle's professional broadcast products with Avid's product line (Liquid Edition is now Avid Liquid). There's the flagship Pinnacle Studio home video editing software, plus Studio bundled with video capture hardware. And the affordable Dazzle hardware for easy video archiving, editing, and TV viewing. Plus the PCTV line to watch, record and time-shift TV on a PC. Pinnacle also has added a Mobile Media line for place-shifting -- managing and moving videos, photos and music to portable devices, including the Apple iPod, Sony PSP, and DivX devices. The Pinnacle Studio software is available stand-alone, or bundled with video capture hardware -- both PCI boards and external USB break-out boxes. The Studio MovieBox is the USB version -- a palm-sized external device with analog and digital connectors, easy to connect to a desktop or laptop PC, especially for analog capture. The MovieBox has inputs for composite video (RCA connector), S-Video, and stereo audio (2 RCA) for NTSC, PAL, and SECAM. There's also a FireWire in/out connector for hooking up a DV camcorder, and the USB connector to the PC. Studio MovieBox Plus then is the enhanced bundle, with video and audio output connectors on the back side of the box, especially to connect to a TV for real-time preview of your edits. It also upgrades the software to support HDV editing with Studio Plus Titanium Edition. And for studio and videocast productions, Pinnacle also adds a professional hand-held microphone with a small table stand for narration and interviews, plus a 10 by 12 foot green-screen cloth to use as a chroma-key backdrop for compositing overlay effects. Pinnacle even includes USB and FireWire cables. There's a major trend to the high-definition home, with wide-screen HDTV home theatre and even consumer high-def HDV camcorders. But in this era of YouTube and Flash video with short-form, low-res clips, there's also a place for easier and faster shooting, from your camera phone to even highly-portable camcorders that record to flash memory. In contrast to powerful HD camcorders, the emphasis of the pocket-size RCA Small Wonder is on easy and fun shooting. Even the packaging even says nothing technical -- nothing about resolution or storage, megapixels or megabytes. The RCA EZ-105 Small Wonder digital camcorder is amazingly light and comfortable to hold (2.43 x 4.27 x 1.33 inches, 0.31 lbs. ), and great for quick and easy videos ($129). The interface is a simple as possible, with few controls, and no confusing menus or profusion of options. Plus, there's a minimum of connectors, with no power adaptor:, it just uses two standard AA batteries. And no additional cables required to access the clips, with a built-in pop-out USB connector. There is an A/V jack to connect directly to a TV set for immediate viewing. Archos has introduced a new latest Generation 4 line of hard disk-based media players focused on a larger-screen experience, video capture, and wireless connectivity. 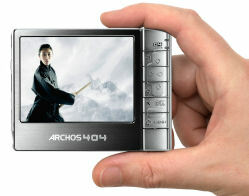 The Archos 404 has a 3.5 in. screen and 30 GB for $299 with a stereo headphone mini-jack, and TV output jack, and supports voice recording. Archos also offers a model with an integrated camera. The Archos 504 is bulked up in capacity with up to 160 GB of storage (40 GB $349, 80 GB $399, 160 GB $599). It sports a 4.3' in. widescreen display (480 x 272). The Archos 604 sports a 4.3 in. widescreen display (480 x 272), with 30 GB for $349. It also offers a model with built-in Wi-Fi for $449. The Archos 704 adds wireless networking for sharing and streaming media (80 GB $549). It has a 5 x 7-inch touch-screen (800 x 480). Our portable devices require portable power, especially if you're using them regularly or on an extended trip. You can use standard batteries, but the cost adds up, and they need to be disposed of properly. Rechargeable batteries make a lot of sense since you can reuse them, but they don't hold as much power as a standard battery, and then you'll need to carry along a charger when you travel so you can tank them up again. The obvious solution is a battery with the charger built in -- not to plug into the wall, but instead the USBCELL from Moxio Energy, with a built-in USB interface to recharge from any powered USB port. 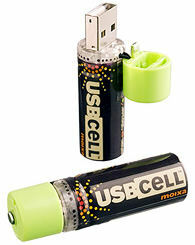 The first product from Moxio is an AA battery, released in September 2006, at a price around $19.50 for a two-pack. The USBCELL is particularly useful to power accessories for your notebook computer, like a wireless mouse. No need for large packs of batteries, and no need to carry a separate charger. Audio books are a great idea for making productive use of your traveling or exercise time -- or just for escapist entertainment. But buying books on tape or CD gets expensive, borrowing from the library may restrict your choices (or take too much planning), and managing electronic book rentals by can get logistically difficult with the downloading and syncing to portable players. Findaway World of Cleveland, Ohio has a different idea that combines the best of both for convenient use: the Playaway "Ready-to-go" audio player -- a small and light digital audio player that you buy preloaded with an audio book. The Playaway site currently lists around 360 audiobooks in a variety of genres, although more than half are fiction, and many more are children and young adult titles. Prices range from around $29.99 to $54.99 for best-sellers and classics. For example, Angels & Demons by Dan Brown is $49.99 (20 hours), though Bleak House by Charles Dickens is $74.99 (39.5 hours). Books are available at stores including Barnes & Noble, Borders, Hudson Books and Brookstone, and at some public libraries, including New York, Chicago and Cleveland. And they were listed in the "O List," in O, The Oprah Magazine. Of course, that's a high price for a book, especially compared to a paperback, and even a lot for a portable audio player that you can't access and reload. But the Playaway delivers an audio book in a really convenient package -- especially if you're at the airport facing a long trip. Playaway actually encourages customers to share their units with friends and family. And it offers a RePlay Rewards program to return units for 50 percent off the next purchase. I've been having a lot of fun trying out portable power solutions for small devices like cell phones and MP3 players -- including the MDI kwikSynCh USB chargers for powering up from USB, and the Turbo Charge cell phone charger to top off a phone from a AA battery. But what is a road warrior to do when you assemble all your devices -- from smaller mobile phones and media players to larger cameras and notebook computers. And how can you be sure you can charge wherever you go -- from wall power, but also in cars and on airplanes. For this you need to pull out the heavy machinery, like the MFUEL World Pak 120. 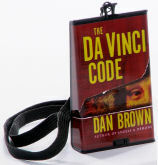 - along with 27 Hot Tips and accessories that should fit more than 90% of current high and low power electronic devices. And as a bonus, the World Pak 120 includes USB and Ethernet Hot Tips that allow the low power cable to be used as a standard USB or networking cable. And MFUEL includes a surge protection guarantee that protects your compatible portable electronics from unstable power. And there's a travel bag to fit this all into. The World Pak 120 unit is approximately 5 1/2 x 2 7/8 x 1 1/4 inches and 720 grams. When plugged in, the MFUEL logo glows, and blue LEDs indicate the voltage being supplied on the high and low power lines. 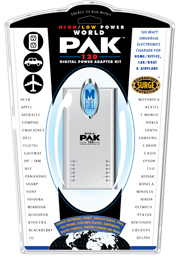 The World Pak 120 is priced at $249.99 at the top of the MFUEL product line, which includes a variety of options for different power levels and sources, as described below. The next generation of digital cameras is coming out, following announcements timed to the PMA (Photo Marketing Association) conference held last month in Las Vegas. The good news for consumers is the end of the artificial megapixel wars. Instead, the new trends are really helpful developments in the image processing chips that assist with shooting better photos -- including stabilizing camera shake and enhancing focus and exposure with amazing technology like face recognition. Megapixels are no longer a big issue -- most cameras have more than enough resolution for Web photos and even normal-size prints, and 4 to 5 MPs should be enough for even full-page prints. And note that "high-definition" video at 1920 x 1080 resolution is only 1.7 MP, so these cameras also can shoot up to HD video clips -- some even can capture video and photos simultaneously. We're also seeing a movement away from tiny pocketable cameras to devices with better lenses, readable displays, and manageable controls -- after all, these days we're already carrying a camera in our mobile phone -- now often with multiple megapixels. Instead, consumer cameras are getting more powerful, easier to use, and adding some really interesting features that can help you take better pictures. As you look at the new models, you'll see trends like larger LCD displays -- some touch screen, and some with auto-brightness adjustment for better visibility in difficult lighting. And you'll notice clever approaches to folding better lenses into handheld devices, some with up to 10X zoom, -- including Kodak's Dual Lens cameras with switchable lenses and the Canon PowerShot TX1 with the lens mounted out the side like a video camera. But there's even more interesting improvements inside the cameras, in the image processing chips that are now being promoted with brand names. Optical image stabilization (not digital) adjusts the lens to compensate for unwanted camera motion, not only reducing blurred photos, but also allowing shooting with longer zoom and lower light levels. Exposure improvements include features to boost ISO levels with more aggressive noise reduction, variable flash levels to add some fill light without washing out the scene, and multi-shot modes to bracket the scene with higher and lower exposure levels or by shooting with and without flash. Some cameras also have motion detection features to boost ISO and shutter speed if the subject is in motion, or to wait for movement to stop before shooting in self timer mode. Perhaps the most amazing new technology appearing in digital cameras is face recognition. The typical problem when shooting a group portrait is to have the camera focus on the background behind the group, and under-expose the scene because of a bright background. New cameras with face recognition actually look for multiple faces in a scene, and then set focus and exposure to optimize for the people that are the purpose of the photo. Some cameras then let you review the photo in the viewfinder by stepping through zoomed-in views of each face -- up to as many as 10 faces in each shot. The next big feature coming to digital cameras is GPS to associate location with your photos, so that you can organize and search your collection geographically in tools like Adobe Photoshop Elements. For more on trends and sample digital cameras, see the Digital Photo Cameras Gallery. One of the themes of this year's NAB conference last week in Las Vegas was the continued proliferation of formats, channels, and devices that content developers need to support for delivering media. This broad range of needs for even today's independent and corporate content developers is demonstrated by the focus on suites of creation tools from companies including Apple, Avid, and Sony -- and in the highly-integrated new Adobe Creative Suite 3 line. Just look at the range of delivery options for today's markets -- high-definition with surround sound to tiny screens with headsets, long-form productions to snackable clips, huge flat-screen monitors to hand-held portable players and mobile phones, streaming Internet to physical disc, lean-back passive entertainment to lean-forward interactivity, Windows to Macintosh to Linux to embedded CE devices, set-top to desktop to portable. Adobe has been working on the next generation of its design and development tools since the release of the previous version, Creative Suite 2, in 2005. While Adobe typically releases major updates on a two-year cycle, it added to its workload for this release by pre-announcing that it would be bringing its full suite of production tools back to the now Intel-based Macintosh platform. But even Adobe's tool set was not broad enough in this age of Internet media and interactivity, so Adobe acquired Macromedia in 2005 in order to add Web tools and especially Flash to its portfolio. The result of this effort was officially announced in March 2007 -- the Adobe Creative Suite 3 product line, addressing production across the range of print, web, interactive, video, film, and mobile. This collection includes full upgrades of 13 major applications, several new applications, plus some 6 additional technology components. The Design and Web components of the suite officially shipped on April 16, with the Production (video) tools due to ship in the third quarter 2007. With the impending arrival of the new versions of Adobe's Production suite as part of Adobe Creative Suite 3 -- featuring Premiere Pro CS3 and After Effects CS3 Professional -- this is a good time to think about brushing up on your skills with these applications. Jan Ozer's recent book, Adobe Digital Video How-Tos: 100 Essential Techniques with Adobe Production Studio, provides a great resource for new ideas and more efficient workflow with these applications. This skips past all the obvious stuff -- like the basics of opening files, working on the timeline, and exporting in multiple formats -- to focus on tips for taking better advantage of these applications for a more efficient workflow and better results. In particular, Ozer is great at exploring multiple ways of achieving specific results like text animation, chroma keying, motion tracking, and stabilization -- moving from quick fixes to more custom solutions, and from Premiere Pro to After Effects. Along the way, Ozer includes sidebar notes to explain some of the fundamentals that you may have missed. And he speaks in a friendly tone, for example explaining in "Five Things You Don't Know About Premiere Pro Transitions" that he's actually provided 11 concepts, but he's only promising 5 since he assumes that "you know at least several of them." Ozer, of course, is the ridiculously prolific author of multiple books and regular articles in PC Magazine and EventDV. He also teaches courses in digital video production, and keeps his hands dirty and his mind in the game by shooting and producing DVDs for local musicians. Want the whole Adobe CS3 Master Collection? You can get the Design or Web suite now, and then pay the difference in price to add the video production tools when they ship this summer. Adobe's recent release of Creative Suite 3 should make design folks happy (with the new Photoshop, InDesign, and suitemates) as well as please Web developers (with rebranded and rebundled Flash, Dreamweaver, and friends from Macromedia). But video production folks are still patiently waiting for the new After Effects, Premiere Pro, and companion tools, which are due to be released this summer. But the whole point of this suite is that today's developers need the full integrated set of applications -- to work on stills and video and animation -- and then deliver across documents, video, and the Web. So what you really want is the full CS3 Master Collection -- some 13 applications, plus 6 additional technology components, bundled into one package for US $2499. And you want to get started with them now. So how can you buy the shipping part of the package now, and upgrade to the video production tools when they become available? The answer from Adobe is that you can do just that -- buy a CS3 Design or Web suite now, and then you will be able to step up to the full Master Collection for the difference in price (Adobe's estimated street price). This offer holds for both new purchases at full price and upgrades. The HDV format (MPEG-2 HD video on DV tapes) has brought HD video to a much broader market -- with HDV camcorders for consumers down to around $1000. And for high-end video enthusiasts and event videographers who want a more professional unit, there's now a broad range of affordable choices in the $4000 to $10,000 range. 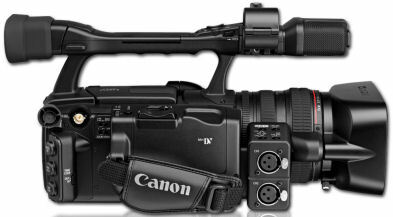 Here we'll focus in the Canon XH A1 HDV camcorder, which has a nice design that shows the broad range of features that are available in this price range. It's easily carried and yet packed with pro features, with 3 CCD sensors, 1080i resolution, and a 20X lens, and all for under $3999. The XH A1 also has a twin, the XH G1, which adds Professional Jackpack that provides time code and HD-SDI output for $6949. Canon also offers its Console Image Control and Storage software that provides remote control of camcorder functions and customization of its settings from a Windows computer through a FireWire cable. And we'll take a quick look at Focus FireStore FS-C Portable Recorder that can record video direct to hard disk drive for fast access for editing without shuffling through tape. The first software for Blu-ray authoring, including CyberLink, InterVideo/Ulead, and Roxio MyDVD, used the basic BDAV (audio/video) format that was designed for recording video clips to disc, but without menus or fancy DVD interfaces. Roxio DVDit Pro HD is the first tool to offer full-up DVD authoring for Blu-ray discs, using what's known as BDMV (Movie) mode. The base Roxio DVDit 6 Pro is $299.99, with support for up to 8 audio and 32 subtitle tracks, plus Dolby Digital stereo encoding (plus pass-thorough support for 5.1 surround sound). But we're interested in the full Roxio DVDit Pro HD for $499.99, which allows you to author a project at full HD resolution, and then deliver the result as fullscren or widescreen, standard DVD and/or Blu-ray. It's all the same old DVD authoring stuff that you may remember from the previous version, except that you can now author menus with full HD widescreen content, and it outputs to Blu-ray format. Check out Roxio DVDit Pro HD on Amazon.com. Check out Adobe Creative Suite 3 on Amazon.com. Entries posted to Manifest Tech Blog in April 2007, listed from oldest to newest.